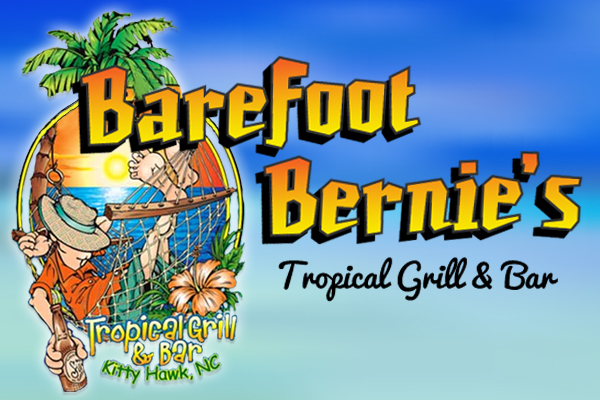 Specializing in exquisite and refreshing island cuisine in a classy yet casual tropical ambience, Barefoot Bernie's in Kitty Hawk has become a true destination on the Outer Banks restaurant circuit. The bright and welcoming family environment of Barefoot Bernie Tropical Grill & Bar gives diners the sensation of being on a tropical island. Enjoy lunch & dinner at Barefoot Bernies or just stop by for a refreshing cocktail or specialty drink at the bar (with three wide screen tv's). The restaurant also offers 12 flat screen televisions with league packages to watch. Barefoot Bernie's Tropical Grill & Bar's lunch menu includes favorites such as Grouper in a Bag, Asian Tuna Salad, Crab Cake Sandwich and Philly Cheese Steak. The dinner menu is equally creative including popular dishes such as Macadamia Crusted Mahi, Cuban Style Steak, Ka Pow Coconut Curry Chicken and Shrimp, Chicken Jambalaya and Pecan Crusted Flounder. We also offer many gluten free items and a new "Lean-A-Licous" menu with items under 550 calories.